Home // Newsroom // Donation Essentials // Know the Facts: Who Can Be a Donor? Why Don’t People Sign Up To Be a Donor? Lack of Knowledge: Many of those that have never considered organ donation or have delayed signing up to become a donor, do so because of inaccurate information or assumptions about organ donation and transplantation. “I’m Not Healthy Enough”: In both Colorado and Wyoming, someone thinking they are not healthy enough to become a donor at the time of their death is the second most common barrier to signing up to become a donor. Twenty percent of Coloradans and 17 percent of Wyomingites that haven’t signed up to become a donor haven’t registered because they assume they’re not healthy enough, according to independent research that we conducted in 2017. So, Who CAN Be a Donor? The truth is, ANYONE—regardless of age, lifestyle or medical condition—can sign up to become a donor. Even those with chronic conditions and other health issues can register to give the gift of life. 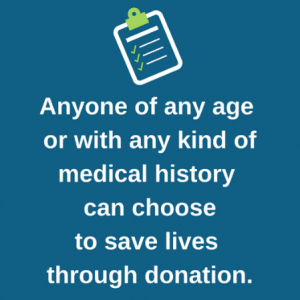 Learn the facts about who can become a donor. 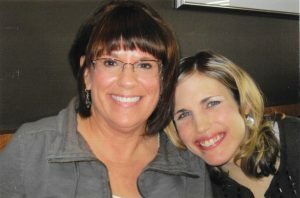 Kate Gallagher – Monument, CO: Despite her liver disease, Kate was able to save the lives of others through organ donation. Kate was on the waiting list for a liver transplant when she suffered a cerebral hemorrhage on March 12, 2012 and passed away before she could receive a new liver. She was 26-years-old. As an organ donor, she saved three lives that day: one of her kidneys went to a grandfather from western Colorado, the other went to a grandmother and her heart went to a 12-year-old girl who had suffered a heart attack on the basketball court. Just one donor can save up to eight lives through organ donation and save or heal more than 75 through eye and tissue donation. Interested in becoming a donor after death? Learn more about the process. Once you’ve made your decision, signing up is easy! 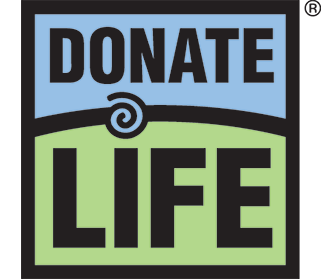 Just say Yes each time you obtain or renew a driver license or state ID, or visit our registry websites, www.DonateLifeColorado.org or www.DonateLifeWyoming.org, and click the ‘Become A Donor’ button! In 2017, we conducted a study examining Colorado and Wyoming residents’ sentiments surrounding organ, eye and tissue donation. We’re sharing some of the results on Donation Essentials to educate the public on the donation process, barriers to registration and what exactly the little heart on your driver license means.